When you think of a maternity photoshoot, you think about images that are soft, gentle, graceful, and warm... but not in this case. 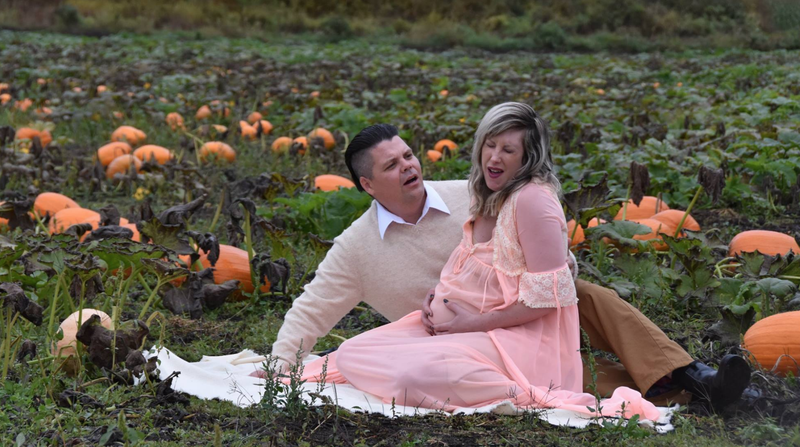 This Halloween-themed maternity photoshoot is more frightening than cute. Calling lovers of Halloween and all things gruesome! This photoshoot is what horror movies are made of and feels like something out of 'Stranger Things'. New and expectant parents usually take pictures that are sweet and romantic, but while this one begins in a pretty standard way, it ends with the birth of a baby... an alien baby, that is. These parents-to-be did not want their maternity shoot to be boring, so when husband Todd saw an alien prop in a store, he concocted a plan. According to Bored Panda, Todd and Nicole Cameron are huge fans of Halloween and anything that involves costumes. This is how the weird photoshoot theme came about. I had an idea for the general story and props needed, including carving the alien pod pumpkin and Nicole took care of finding our “out there” wardrobe. In the end, their dreams were made a reality, and the couple is extremely thrilled, taking to Facebook to show off their out-of-the-box maternity shoot. Check out these pictures and let us know if this is something you would consider doing for your maternity shoot. Images captured by Li Carter. You can also follow the 'new baby' Burston.